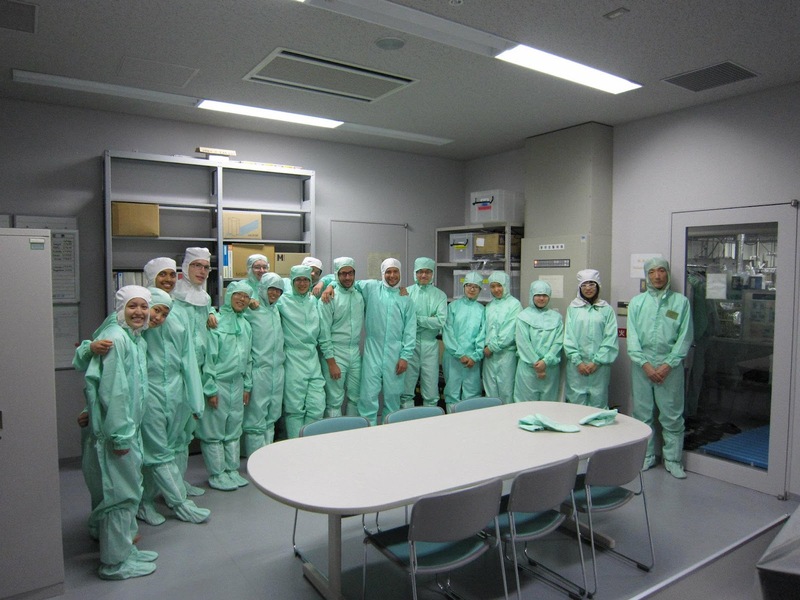 On the last day of the program, we were brought on a study trip to Hitachi and RTRI as part of the Nanoscience course. Although the research that these two corporations deal with is not so related to nanoscience, the trip still gave us a holistic and interesting perspective on the development of science and research in an industrial setting. 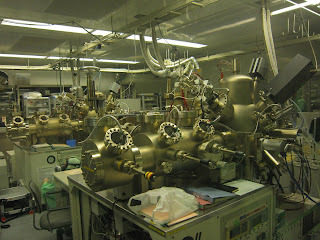 Due to the no-photos policy in Hitachi, I'm not able to share any pictures of the research labs. Previous to the trip, my only perception of Hitachi is that it is a manufacturer of air-conditioners, computers, televisions and other home electronic appliances. However, it turns out that this view is too limited. From the study visit, I learned that the corporation engages in technological research and development in a myriad of disciplines, and is on the way to develop advanced equipments such as personal identification systems based on finger veins, and MRI (Magnetic Resonance Imaging) machines. Next, we went on to visit RTRI (Railway Technical Research Institute), the technical research company under the Japanese Railways group of companies. JR (Japanese Railways) operates a large proportion of intercity rail service, including the well-known Shinkansen, as well as local commuter rail service. The Large-Scale Rainfall Simulator can test for train conditions and performances during harsh weather. Different levels of rainfall can be simulated, and we were allowed to experience the top level, with umbrellas provided of course. This is a nice change from the hot and humid Tokyo weather that day. The two photos above show the different Maglev models developed, the top one being the original/primitive model, and the bottom one being the modern model. Maglev trains work on magnetic levitation principles, as compared to mechanical methods like wheels and bearings. Such trains can reach high speeds of up to 500km/h. A Wikipedia search states that the highest recorded speed of a Maglev train is 581/h or 361mph, and is achieved in Japan by JR Central's superconducting Maglev system in 2003. This is 6km/h or 3.7mph faster than the conventional wheel-rail speed record, set by TGV, France's high-speed rail service. On Tuesday, we got a day off from class and so a few of us decided to head over to Ghibli Museum near Kichijouji station. Actually, we planned way beforehand to come to this place. In order to gain entrance, we needed to book tickets in advance at any Lawson convenience store. As expected, the weekend tickets are sold out very quickly. For weekday tickets, booking one or two weeks in advance will be sufficient. The entire train journey from Hongsanchome to Kichijouji station took us approximately an hour. When transferring at Shinjuku station, take note to take either the Rapid or Limited Express trains, which skip some stops and hence reach the destination in a shorter period of time. The Local train, on the other hand, stops at every station and hence consumes precious time. The Ghibli Museum is a short walk away from the train station. It is situated right beside Inokashira Park, a quiet area quite unlike the busy streets in central Tokyo. The museum is not very big, but nonetheless, it never fails to surprise. Having watched more Ghibli movies before the museum trip will probably make the visit even more interesting, since you will then be encountering a familiar character or scenery at every turn. Considering there are a total of twenty-one Ghibli films up till present, starting early seems like a good idea. Inside the museum, exhibits include a short movie, interactive displays on animation production techniques and drawings. It is indeed amazing to see how frames from the movies are hand-drawn and colored. The trip definitely made me a greater fan of Ghibli Studio. There are numerous colorful and cute stained-glass decorations throughout the museum. However, taking photos inside the museum is prohibited, and we so have to content ourselves with pictures taken from outside the building and in the garden. Don't forget to see the giant Totoro overlooking the museum entrance! Besides the Ghibli museum, make the long trip to Kichijouji count by visiting the Inokashira Park on the way, shop near Kichijouji station, and eat the famous meatball at Satou (a small shop in the shopping area around the station). I heard from a friend that in a survey of the most habitable place in Tokyo, Kichijouji came up top. So definitely try this place out, especially if you like Ghbili movies! On Thursday this week, we attended class at the Komaba campus, which is about 1 hour away from the Hongo campus where class is normally held. The professors lectured about nanoscience and nanotechnology in the fields of the physical sciences. And for the lab tour, we were allowed to visit a clean room! In order to maintain the cleanliness and the dust-free condition of the laboratory, we were required to adorn the special green outfit that covers every part of the body except for the face and hands. After which, we also had to enter a small chamber to be air-blown clean. As we subsequently visited other clean rooms on later days, we learned that the clean rooms actually differ in terms of the number of particles in the room atmosphere. There are rooms with 10000 particles, 1000 particles, 100 particles etc. And the cleanest one that we saw has only 1 particle! As compared to the millions of particles in the normal atmosphere in modern metropolitan cities, those figures are really astonishing! The clean rooms contain elaborate equipments like this Molecular Beam Epitaxy (MBE). The machine provides a high vacuum compartment conducive for manufacturing semiconductor devices, such as transistors. Depending on the type of semiconductor material to be manufactured, different models of MBEs are used. 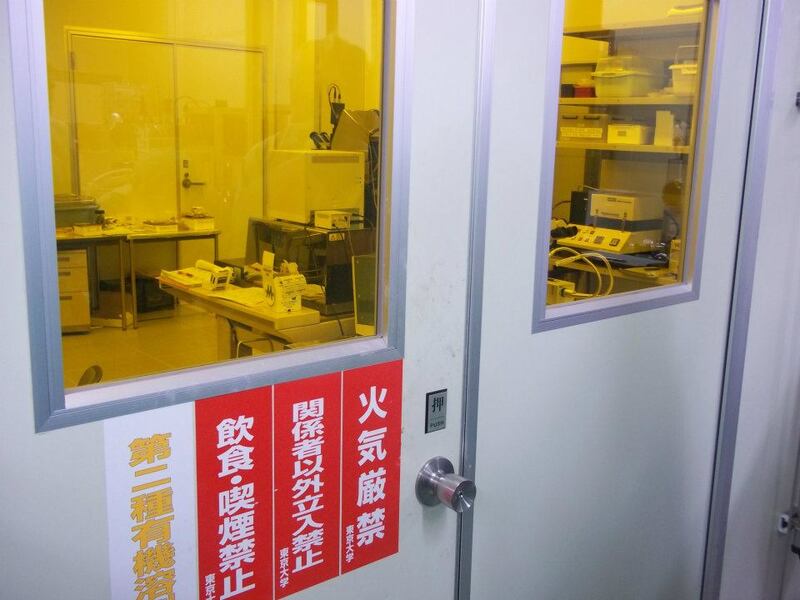 This is another of the laboratories in Todai. The light used is yellow in color, so as to reduce the exposure of the experimental materials to UV. Today marks the start of the Nanoscience course at Todai. We ventured deeper into the Hongo campus to the Engineering buildings where our classes will be held. It's about twenty minutes' walk from the hotel. Being a short course, there are only seven days of class, plus an extra day for study visit at the end. For each day, the schedule consists of two lectures and a lab tour. The two lectures for the first day are Nanotechnology and Materials Science for Nanoscale Cell Therapy: "Development of High-Performance Structural Biomaterials" and Mechano-Bioengineering: "Computer Aided Surgery and Surgical Robots." As I have not taken any biology classes since high school, the material seems slightly foreign, yet novel and exciting at the same time! The material is appropriately selected to provide an introduction to the topics, and such that students with all levels of knowledge of the subject matter can understand and enjoy the class. Besides the technical knowledge, we were also shown models and video-demonstrations. For the Biomaterials lecture, the professor introduced the technique of inkjet printing to accurately produce 3D models. The concept is similar to 2D printing, except that the machinery works on printing multiple layers to produce the 3D result. We were shown a calcium phosphate model of a human skull made using this technology. Later on, in the laboratory, the professor showed us a ball made of a hydrogel with homogeneous chemical network. This hydrogel ball does not compress easily and can bounce like a powerball. The students working in the laboratory demonstrated the rudimentary making of the hydrogel in a text tube. After mixing some chemicals and waiting just a few minutes, the concoction solidified. Gently knocking the test tube against my palm, there is a weird sensation as the tube does not bounce back as one would usually expect, but rather the gel seems to resonant within. According to the students' explanation, the gel does not dissipate energy due to its special molecular structure. This has indeed been an unique and eye-opening experience. And as the professors discuss the possible applications of the technology in medicine, surgery and even in everyday uses like contact lenses, I highly anticipate the day when these applications become reality to better serve the society. Climbing Mount Fuji is like a dream come true! Being approximately 2.5 hours away by bus from Central Tokyo, Mount Fuji has always been on the top of my to-see list while I'm in Tokyo. Scaling it though, has just stayed a tentative proposal. Fortunately enough, Marine Day falls on the third Monday in July, such that the 3-day long weekend coincides with the GSP schedule and allows me sufficient time to prepare and to climb the mountain. Moreover, the official climbing season occurs in July and August when most of the snow on the mountain has melted. According to the weather forecast, the day is clear on the day of the climb. It is especially important to research on the weather before setting off for a climbing trip. Climbing in rain is undesirable and dangerous, and nobody would like to view the sunrise or sunset on Mount Fuji on a cloudy day. Temperature can drop to as low as 0-5 degrees Celsius near the summit at night, and the winds can be strong. Hence warm clothing, and especially a windbreaker, is absolutely necessary. We took 8 hours up and around 3 hours down. The ascent and descent routes are on different sides of the mountain, but both leads to the same stop at Kawaguchiko 5th station. Of the climbers, a large proportion is foreigners, and the over-night ascent to watch the sunrise is the most popular. An alternative is to watch the sunset in the evening, although the temperature may be high during the climb at noon. Time really flies and we have already reached the end of the first course, Introduction to Japanese Language. It has really been a wonderful experience learning from the senseis and learning alongside students from universities across the world! During the 8-days course, we learned how to make short self-introductions, ask for directions, ask for prices, make basic comments etc. Although this knowledge is far from sufficient for me to enjoy Japanese dramas, books and other entertainment completely, it's a start and I'm prepared to try to self-study some Japanese after the course. As a study trip, Todai arranged for us to visit the town of Kamakura. Once a political center of Japan, Kamakura now is a famous tourist attraction. The old historic town is sometimes acclaimed as the Kyoto of Eastern Japan, and is filled with temples, shrines and other historical monuments. Kamakura is different from the modern metropolitan city of Tokyo in many ways. I've learned so much about historic Japanese culture here and I really enjoyed the trip. Some other attractions worth visiting are the Kamegayatsuzaka Pass, Kewaizaka pass and Zeniarai Benten Shrine. We missed these spots due to time constraints. Although town is slightly far, being about 2hours drive away from Todai, it is definitely worth the time to make it there and immerse in the remnants of the Japanese past. And so my first week at Tokyo came and went. On Saturday, I traveled to Odaiba, which is slightly far from the hotel as it is around 40 minutes and 2 train transfers away. The trip is very worthwhile however. Odaiba is a large man-made island in Tokyo Bay, and is connected to Central Tokyo by the Rainbow Bridge. I would especially recommend the National Museum of Emerging Science and Innovation, or Miraikan, near the Telecom Center Station. Through interactive displays, one can have fun while learning about some of the latest cutting-edge technology in the market or in development. All the exhibits come with English explanations, so one can enjoy the museum even if one does not speak a word of Japanese. However, few of the volunteers at the museum speak English, so that makes it difficult if you have a specific question about any of the exhibits. Large spherical display made up of LED panels. ASIMO, a robot that talks, walks and dances. Besides the museum, Odaiba is filled with other interesting attractions as well. For instance, check out the mini replica of the Statue of Liberty, the La Flamme De La Liberte, and the giant gundam. The Fuji Television Building and the Tokyo Big Sight have some unusual architectural designs. Not to mention, there's a few large shopping malls to keep one busy too. Depending on the season, one can walk across the Rainbow Bridge connecting Central Tokyo and Odaiba during certain hours, where one can enjoy the cool sea breeze and the magnificent view of the area at night!